Home Politics Nigeria Politics International Community Focus on Nigeria: What changed between 2015 and 2019? International Community Focus on Nigeria: What changed between 2015 and 2019? The interest of the international community in Nigeria’s 2019 general election is not new but the mixed reactions trailing it call for concern. Historically, stable democracies show concern about the electoral process of virtually every country in the world, without physically interfering in the affairs of the countries concerned. Such is already playing out in Nigeria where the US, UK, European Union, EU, United Nations, and Switzerland among others, have expressed their views on the need for credible elections in Nigeria. Even at the commencement of the campaigns for the elections last year, the EU, France, Germany, UK, US, Australia, Austria, Bulgaria, Canada, Czech Republic, Denmark, Finland, Greece, Hungary, Ireland, Italy, Japan, Netherlands, Norway, Portugal, Republic of Korea, Romania, Slovakia, Spain, and Sweden, had as a bloc and individually, made a case for free and fair elections. Similar statements have also been made by some of these countries recently, making it obvious that the world cares about whatever happens in Nigeria as a result of the polls. Leading the pack, was the US, which sent a strongly-worded message through its Secretary of State, Michael Pompeo. It specifically asked the Independent National Electoral Commission, INEC, to resist external “pressure and intimidation,’’ saying the exercise would be an opportunity for the country to solidify its democratic leadership in Africa. ”Elections are only one part of the democratic process. The words and the actions that happen in these final days of the campaign, and then all the work of government after are as important in a democracy as the elections themselves. So there it isn’t a nutshell. Number one, Know your rights. Number two, vote and exercise them. Number three, if you work for the government or if you work for a party, make sure you remember that it is your individual responsibility to act consistently with the laws. The UK on its part promised to deploy more than 100 observers to 15 states, in addition to calls for a credible exercise. British High Commissioner to Nigeria, Catriona Laing, who said this in an interview with Nigeria Info FM in Abuja, said: “As an independent observer country, we respect Nigeria’s sovereignty; it is our job to stand with the people of Nigeria in this democratic journey. “The process is what matters to us. This is why we will be deploying over 100 observers in 15 states to support observer missions from the European Union, United States Diplomatic Mission in Nigeria and other local observers. Irrespective of the fact that such calls do not mean interference, a few stakeholders in Nigeria, especially ruling All Progressives Congress, APC, appears disturbed by the development. The most poignant response came last Monday when the spokesman of the Buhari Campaign, Mr. Festus Keyamo in the most vicious attack on an American government and its ambassador since the Sani Abacha days released a blistering attack on the US and Ambassador Symington. “We take the view that the constant statements by Ambassador Symington and the other diplomats are implicit attacks against the government of Nigeria. These statements imply the Nigerian government is inclined to rig the election in favour of President Muhammadu Buhari. The disposition which is evident from the utterances of some top members of the APC appears surprising given that similar efforts were made in 2015 by the international community. In the build-up to the election that brought the APC to power, ex-US Secretary of State John Kerry had visited then-candidate Muhammadu Buhari and then President Goodluck Jonathan as part of efforts at ensuring credible elections. Kerry had advised Jonathan, Buhari, and others to work towards ensuring peaceful and violence-free polls. His message read thus: “The US government strongly believes in Nigeria having credible, free and fair elections next month. We want to say that any Nigerian who promotes any form of violence during the elections remains ineligible for U.S. visa. On the heels of that was President Barack Obama’s video message, sensitising Nigerians on what the election meant for the nation and democracy in Africa. Obama said: “Today, I want to speak directly to you—the people of Nigeria. Nigeria is a great nation and you can be proud of the progress you’ve made. Together, you won your independence, emerged from military rule, and strengthened democratic institutions. You’ve strived to overcome division and to turn Nigeria’s diversity into a source of strength. You’ve worked hard to improve the lives of your families and to build the largest economy in Africa. Saying that these efforts among others were instrumental to the peaceful conduct of the election and the historic acceptance of defeat by Jonathan, is, to say the least. 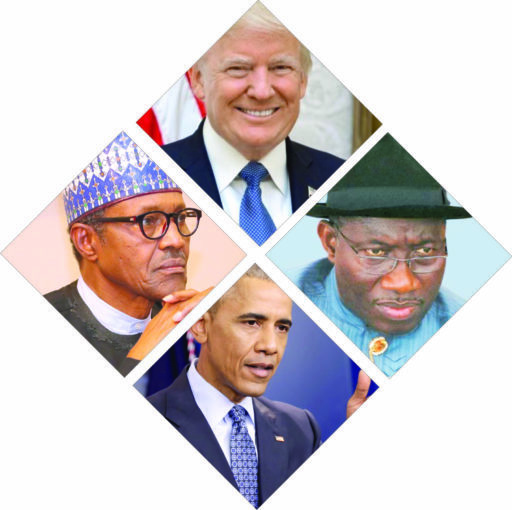 President Jonathan had on his part also alleged that the United States under President Obama had a policy to see to his defeat. However, the counter reactions against similar efforts by the international community this time, has led to this fundamental question: What has changed between 2015 and 2019?